David Powers King: Post: If You Make Them Cry--High Five! Post: If You Make Them Cry--High Five! What a week it's been, and weekend! With a deadline to meet and the Oscars to watch, there's been little time to play . . . or eat, or figure out the fuse in the socket that's not working. 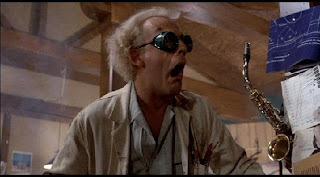 I'd poke around some, but I don't think the Doctor Emmett Brown look suits me, just yet. Got to love the Doc! Docs aside, I'm really looking forward to Spring Forward this week and month. Even more than that, I want to spring ahead with more words than I can keep track of. Before we skip to the updates, here's our weekly SHOUT OUT for those of you who have recently joined The Laire! Carolyn V - she's an author of YA fiction who has already contributed to two published, non-fiction books and is a powerful world builder. Build on, architect! The Golden Eagle - originally from China, she has a wide range of talents, from writing, dancing to music, and a little physics on the side. Our thrusters have been on the fritz, lately. We need more physicists! Thanks! Stacy Henrie - a writer of historical romance and a busy mother, she has plenty of awesome stories to tell (and a rather tasty blog). Excellent! A cook in our midst! Heather Hellmann - this Illinoisan substitute teaching writer is unstoppable, so long as she has endless pens, paper and lots of coffee! Now we're supplied! Dan Harrington - is a freelance writer and published author, who also founded the blog, Man Cave Authors. Versatility and brute strength! Such valuable assets! Tracy - I'm been following her for a while. Why? She's just a neat blogger--and an even better writer! She also likes baseball. What's a starship without baseball? Welcome, ya'll! You know, if we were all part of a crew, with me handling the helm (since I am a graduate of Wing Commander Academy, or I played all the games and won, without dying . . . kinda . . .), I'm sure we'd journey through the cosmos with little incident! Again, thank you for following! Updates: Chapters 7 through 9 are reread and passed to my producer friend for feedbacks. You know, this might be an urban legend, but--is it true that if you make an agent/editor cry, they will represent/publish you? If that's the case, the force is strong here. My producer friend has teared up twice and she's not halfway into the novel yet! To think of the downpour that may come about in later chapters. It already makes me choke! Chapter 18 is well in the works with 2k words so far. This puts me a little ahead of schedule! Ah well. No rest for the wanted. Got to keep this writing train a move'n! What writing urban legends do you know of? I'm David, and rocks make for cheap paperweights. Thanks for the shout out! I don't think I've ever been called a cook before. :) That would be my husband. He's the one teaching me how to be a master in the kitchen. Eagle, Stacy - you're very welcome.